Overland Park, Kansas is located 22 miles south of the Kansas City International Airport, which makes it a quick 35-minute drive to our office. Keep in mind that the Kansas City Airport is in the state of Missouri. And yes, there are two cities side-by-side named Kansas City – one in Kansas, the other in Missouri. A river and an imaginary state line separate them. Kansas City, MO was incorporated in 1853 (first!) and Kansas City, KS was incorporated later on in 1872. Because Kansas City, MO was a booming city in the late 1800s, residents in nearby Kansas wanted to ride on the coattails of Missouri’s success. So now we better understand Dorothy and Toto’s confusion in The Wizard of Oz when their Kansas farmhouse dropped in the land of Oz and she calmly said, “I’ve a feeling we’re not in Kansas anymore.” She was probably wondering if she was in Missouri. The Kansas City metro area might include a state line that separates it, but it’s really one big region at heart. And at the heart of it all is their beloved baseball team, the Kansas City Royals. In fact, our coworkers in the Overland Park office love the Royals so much that they worked with a skeleton crew on November 3, 2015 because they, along with nearly the entire population in the region, went to the parade downtown celebrating the World Series champions. Photo Credit: San Diego Tribune photo of crowd outside Union Station. 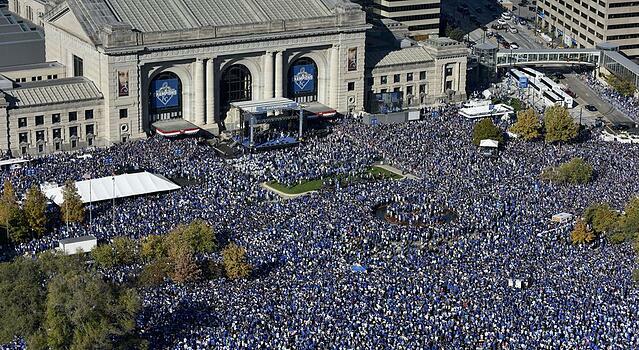 Estimated 800,000 people celebrating Royals 2015 World Series win in front of Union Station. In fact, it sounds like there’s a lot of Royals pride in Overland Park. Emily Benson, longtime employee and retail operations manager, said going to Royals games is her favorite thing to do. “Actually, we have a lot of professional sports teams around here,” she said. “We’ve got the Chiefs, soccer and baseball. It’s all fun to watch, but baseball is my favorite. I just love seeing everyone in the office wearing their Royals shirts, and thankfully we have the Chiefs to offset the sadness when baseball season ends," Emily said. The Kansas City Chiefs football team and the Kansas City Sporting soccer team don’t have the notoriety that the Royals have at the moment, but they still have a strong following in a town that loves its sports teams. That was a tough challenge for both Arrowhead and the former Zurich employees. For the first time ever, Arrowhead had a team of insurance retail sales people instead of the independent agents we typically work with. And the new Arrowhead teammates were used to identifying with the well-known insurance powerhouse, Zurich. 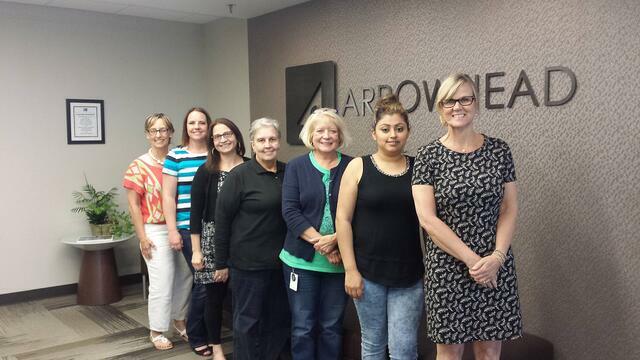 Fast forward to present day: the Arrowhead Automotive Aftermarket team has gone through many phases of change in the past four years. With some of the biggest ones currently underway, the team now has to learn a new product from Zurich, plus an all-new platform and system. Basically, the Aftermarket program was turned inside out then shaken up and down a few times just for good measure. That kind of change is enough to rattle any of us, because in a lot of ways it’s like starting over. The OP office has a charity committee structure with a revolving leadership led by two co-chairs. At the beginning of every year they have an open enrollment for anyone who wants to participate. 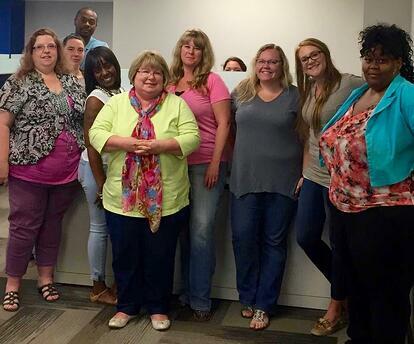 These are the people responsible for putting forward ideas and organizing events every month. It’s about the office coming together and having a good time and they always focus on grassroots initiatives such as buying gas cards for local women with cancer who are driving themselves back and forth to the hospital for treatments. “Currently, there are 12 coworkers on the committee and we require that each team member lead an event. That way no one person is ever overloaded and it spreads the work out,” Datha said. One of the most recent initiatives the OP office organized was for Make-A-Wish®, a charity with a vision to grant the wish of every child diagnosed with a life-threatening medical condition. “They actually reached out to us and asked us to get involved,” Datha said. And because they have local chapters with a majority of all funds raised going directly to the children, the OP charity committee agreed this was an organization they wanted to help. 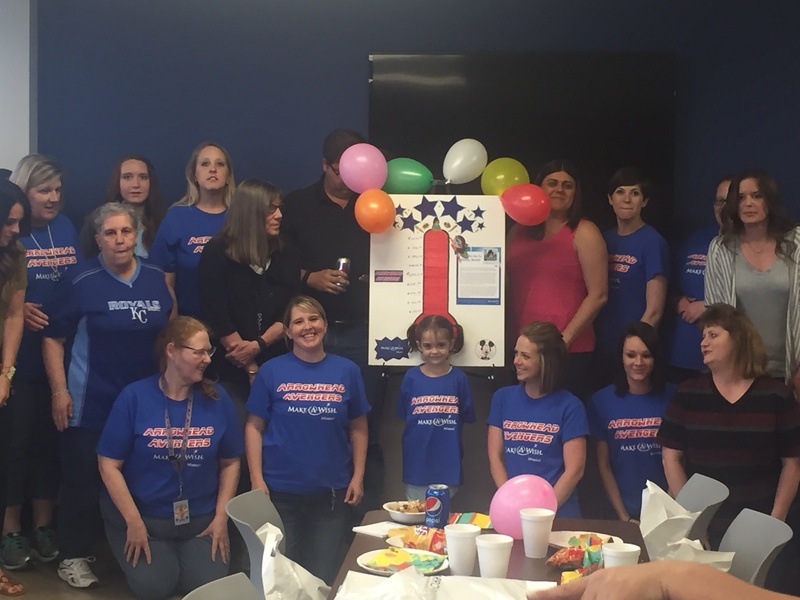 The OP office set their goal at $5,000 and started raising money in February for five-year-old Natalie who was diagnosed at birth with Tracheal Esophageal Fistula and Esophageal Atresia type C (EA/TEF, for short). Natalie’s wish was to go to Disney World with her family and see all the princesses. Enter the Arrowhead Avengers. With a super hero theme and matching T-shirts, the OP office banded together to raise money with events like selling their Arrowhead Avengers T-shirts, tailgate lunches, raffling off Royals baseball tickets, a chili cook-off, the Make-A-Wish® Walk for Wishes 5k and of course the infamous change wars. The object of the change wars was to load up a manager’s jar with loose change. At the end of the battle, any manager who had at least $50 in their jar had to spin the wheel of misfortune. The wheel included fateful tasks such as a pie in the face, taking a shot of hot sauce, eating a sardine, dancing the whip nae-nae, standing on a chair and singing 'I’m a little tea pot' and riding around the office on a big wheel. Fortunately for little Natlaie all the managers who participated were unfortunate enough to spin the wheel, raising over $400 in change for her dream of going to Disney World. The team also held additional fundraising events this spring such as a Cinco de Mayo fiesta, ice cream floats, jeans days and more raffles. 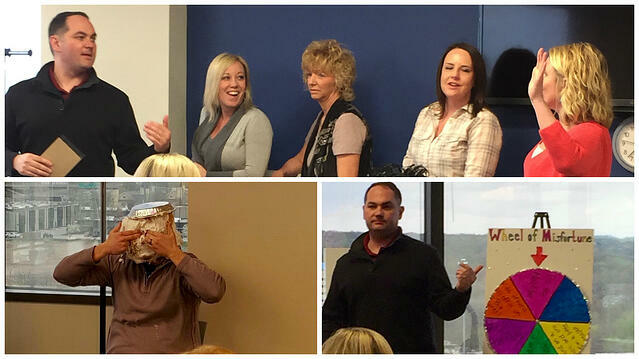 Plus, the San Diego office got on board with a bake sale and raised $1,576. Datha said that collaborative effort from another office really touched the team here. “Sometimes we feel the distance between our offices and watching them pick up our initiative was the best thing they've ever seen." In early June, Natalie was well enough to come into the office and meet her Arrowhead Avengers as they presented her with her Disney trip wish. “Natalie came by and she’s the sweetest thing ever,” Datha gushed. “She told us how she’s packed and about all the princesses she’ll see there.” People throughout the office were so excited to help Natalie that they bought her little gifts for her trip such as beach supplies, towels and baskets. "People bought those on their own dime. It was very sweet of them and seeing Natalie there smiling was worth all the hard work the team had put in," Datha said. Little Natalie standing in front of her Arrowhead Avengers Goal Poster - The team raised over $5,000 for Natalie and her family to go to Disney World in June. 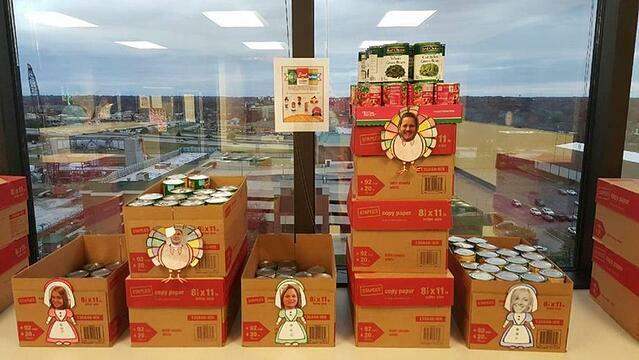 Last year around Thanksgiving, the Overland Park charity committee created the Thanksgiving Wars. The mission: collect the most canned foods for a local homeless shelter. So, the committee got creative and gave each manager a box. 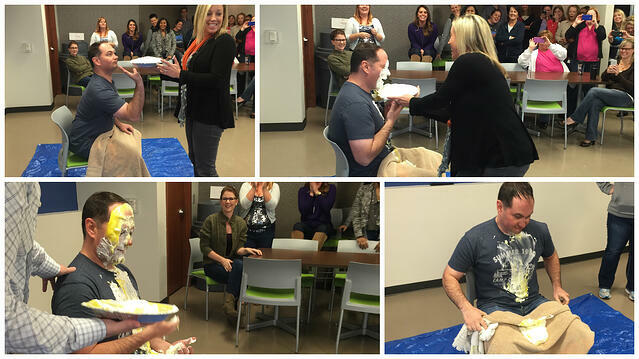 Coworkers could then put cans in the boxes of the managers who they wanted to get a pie in the face. And so naturally managers started secretly plotting against each other. Patrick had been hording cans in his office and at the very end of the collection drive with minutes to spare, he came in with a truckload of cans and put them all in Adam Johnson's box making him the unfortunate pie-in-the-face recipient. Overall, the team donated 1,000+ cans. “The Shelter was completely blown away,” Datha said proudly. “We were featured on their website and Adam got a big juicy pie in the face.” Sounds like we can call this event a huge success. Way to go Team OP! Automotive Aftermarket President Adam Johnson takes one for the team after losing the canned food drive to more crafty and resourceful managers. Next up on the Overland Park’s charity committee’s agenda is collecting school supplies for kids this August, Austin Hern said. Austin is a new account manager with the team as of March 2016. Austin is heading up his first campaign this summer and he’s excited. And yes, people from all over the company can help. Just give Austin a shout! 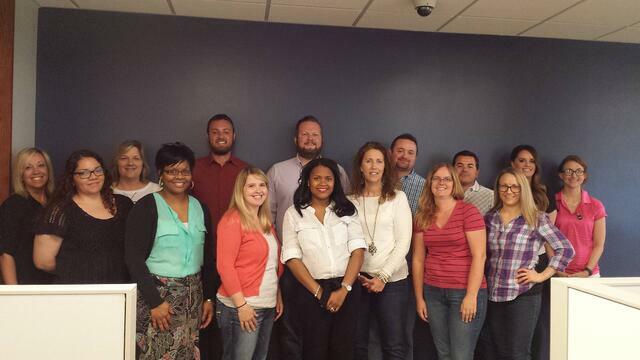 With so much heart coming from the people in our Midwest office, it’s no wonder they live in the Heartland of America. 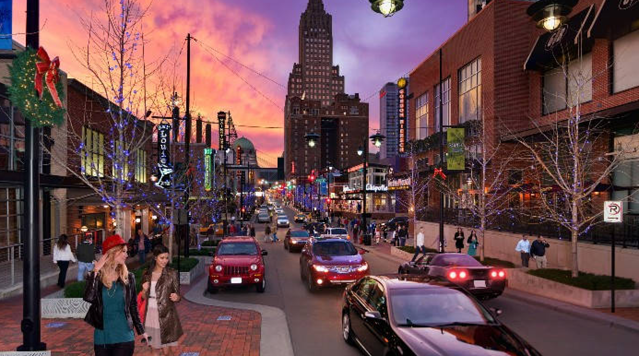 But sometimes that conjures up images of small town U.S.A. Patrick confirmed the comment he most often hears from outsiders who visit is, "I didn’t realize there’s so much to do in Kansas City." "And then when they’re here they realize this isn’t one big wheat field," he laughed. "But if you go west about 40 miles you’ll run into them." “Most people are surprised to see it’s not such a cow town after all,” Austin added. “There’s quite a bit to do here. 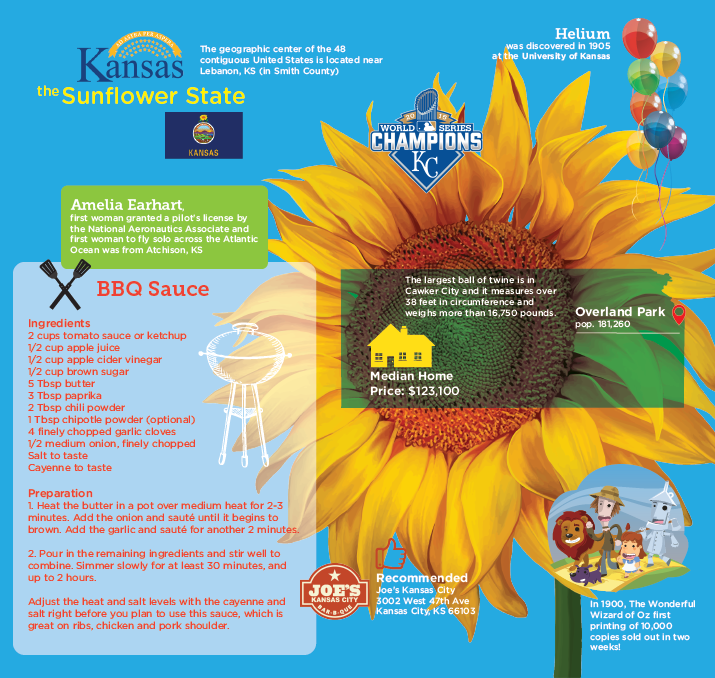 I just think it’s heaven on earth.” Austin elaborated that the Kansas City metro area has the best BBQ, best sports teams and the nicest people. Equally impressed with the area is newcomer Datha who moved to Overland Park with her husband from New Jersey last February after she transferred from our parent company, Brown & Brown. Apprehensive about the move, she was concerned that it was in middle of nowhere. TopGolf– Patrick gave his nod of approval to this new indoor/outdoor driving range. It has three levels, large electronic targets and the golf balls have microchips; plus it has a full-service restaurant and bar. Sounds like an insurance executive’s dream world! Speaking of new homes, the Overland Park office moved to a new building in September 2014, which is right across from their old office. In their new building they are on half of the ninth and all of the 10th floors. The office was renovated using a similar design style as the downtown San Diego office. The biggest compliment on the new space is how much the team is loving the added light. Because this team’s history goes back decades, we want to make sure we honor everyone’s hire dates that pre-date the transition to Arrowhead in 2012. Let’s give a big shout out to Jan Boykin, distribution and marketing manager, who has been with them the longest - over 25 years! 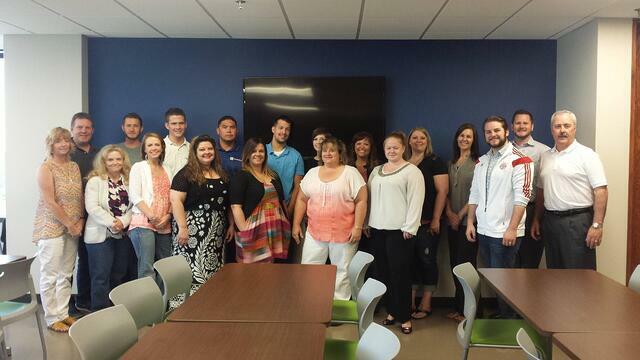 These next folks have been part of the Aftermarket team for over 20 years. Congrats to Mark Brown, regional vice president, Ann Johnson, commercial lines manager (operational focus), Debbie Winterowd, program manager, Jason Lovell, regional vice president and account executive Dan Minor. The Aftermarket team is proud of their growing group, and they do a phenomenal job celebrating and announcing the promotions for their departments. 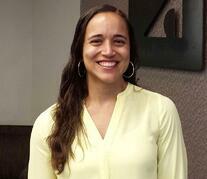 Be sure to check out recent promotions for Lindsey Whitney, Erika Herra and more at our promotions blog. Joe's Kansas City is Austin's favorite BBQ – he orders the Z-man. It’s slow-smoked beef brisket with smoked provolone cheese, topped with two crispy onion rings on a toasted Kaiser roll for $7.39. Jack Stacks – Many of the visiting San Diego teammates make sure to hit up Jack Stack's during each trip to the OP office. It's conveniently close to the office and has a more business-fancy/friendly vibe. And according to Datha, "Jack Stack's is the best BBQ in Kansas City, hands down!" Gates BBQ – This locally owned restaurant is Kristie’s favorite. The owner was born and raised in Kansas City, and they now have multiple locations around the metro area. And how's this for a local business? They offer recipes online! Arthur Bryant’s – “Some people love it but I'm a Gate's girl!" explained, Kristie. Looking at the website, it seems Arthur's has had some famous patrons, including Steven Spielberg and President Carter. Famous Dave’s – "It’s a chain." Enough said. Thanks for the tip, Kristie! The American Royal - Kristie says this local contest is humongous but a lot of fun and a must if you're in the area during the tasting events. Craft breweries are also a hot spot for out-of-towners. So be sure to check out Boulevard Brewing Company in their Overland Park location. Austin says he just loves beer. "It's my favorite summer activity, actually." His advice is to try the Tank 7. It's my favorite beer," Austin said. "It tastes like Thanksgiving dinner!" 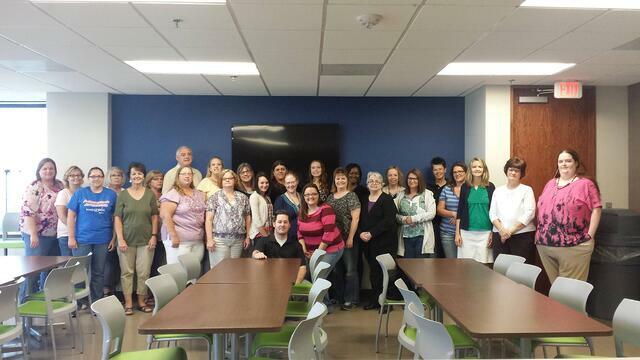 Thank you for visiting our Overland Park, KS office. Next stop on the 2016 company summer road trip – Denver and Phoenix! Be sure to check out our July newsletter.